Femoroacetabular impingement (FAI) is a condition where there is abnormal contact between your femoral neck and the acetabulum (the socket). This contact occurs due to bony irregularities of the ball or socket leading to pain, decreased range of hip motion, labral tears, and cartilage damage. The articular cartilage and labral tissue can fray or tear after repetitive contact of this abnormal socket. FAI impingement generally occurs as two forms: Cam and Pincer impingement. 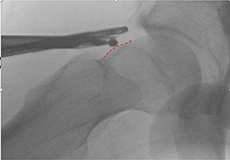 Intraoperative radiograph showing FAI with CAM deformity outlined with red line. This is prior to using bur to recontour the femoral head-neck junction. 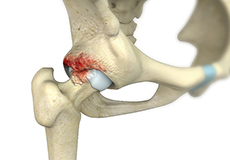 Pincer Impingement: The Pincer form of impingement is when the socket or acetabular rim is too deep. It covers too much of the femoral head resulting in increased contact between the ball and socket. The Pincer form of impingement may also be caused when the hip socket is abnormally angled backwards causing abnormal impact between the femoral head and the rim of the acetabulum. head-neck shape and relieve impingement with the acetabulum and labrum. Most patients with FAI have a combination of the Cam and Pincer forms. Conservative treatment options refer to management of the problem without surgery. 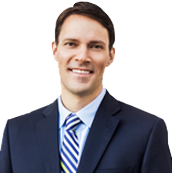 Non-surgical management of FAI will not change the underlying abnormal bone shape that is contributing to the FAI but may improve your pelvis position to relieve pain and impingement. Therapy may also provide relief of muscle inflammation that can mimic symptoms of FAI. 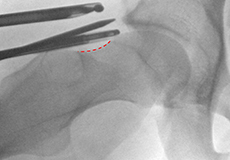 Hip arthroscopy to address femoroacetabular impingement can comprise of reshaping the femoral head, trimming the acetabular rim, repairing labral tears, and addressing cartilage lesions.